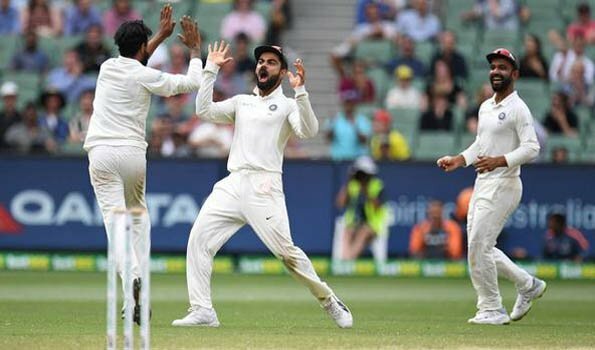 Melbourne: India registered an emphatic victory of 137 runs over Australia on the final day of third Test of four-match series to get an unassailable lead of 2-1 here at Melbourne Cricket Ground (MCG) on Sunday.The play was delayed for over two hours due to rain. Australia resumed their innings on 258/8 and could add only three runs in their tally. Jasprit Bumrah dismissed Pat Cummins for 63 runs to end his resistance that helped the hosts to take this match to the the final day. Then, senior campaigner Ishant Sharma dismissed Nathan Lyon on his individual score of 7. With this wicket, India won the Boxing Day Test match and retained the Border-Gavaskar Trophy having won the previous series in India in 2016-17. This is the first time in 40 years when the visitors registered two Tests win in a series Down Under. In 1977, India won 2 Tests out of five matches, but lost the series by 3-2.Jasprit Bumrah was named Man of the match for taking nine wickets in the Test. He got 6 wickets for 33 runs in the first innings which was his career best in the format.